Starting from standing (Tadasana), step your right (front) foot to the side so that your feet are 1-1 ½ leg lengths apart, then rotate your front foot and leg outwards to face the back of your mat. You can then slightly inwardly rotate your back leg and foot and find a stable base. Inhale and lift your arms to shoulder height and on an exhale, bend the front knee, tracking it over the centre of the front foot (ie not allowing it to drift inwards, which it may want to do!). Gaze forward over the front middle finger. Take several breaths here , ensuring that the front knee faces forward and the arms remain parallel to the floor. Come back into standing by straightening the front leg, rotating the front foot to parallel with the back foot and then step back into your standing pose and repeat on the other side. 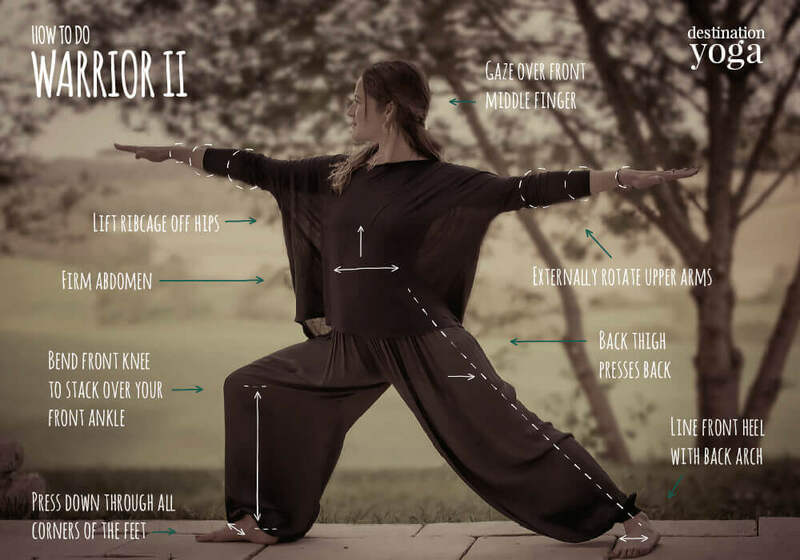 You can come into and out of Warrior II front standing as described above, but you and also come into Warrior II from Downward Dog. From Downward Dog, step your right foot forward between your hands and lift your torso up. Adjust your feet so that your front foot is turning out and your back foot is turning in. To come out of Warrior II into Downward Dog, ‘cartwheel’ your hands down to either side of the front foot placing them on the floor, come onto the ball of your back foot and step your front foot back to Downward Dog. If the full pose isn’t yet comfortable for you, you can start with a less deep bend in the front leg and keep your hands on your hips – or lower your arms a little. For a bit more stability you can widen your stance by a couple of inches – and of course, feel free to use the wall for support. Try to stay ‘active’ in your pose.Warriors are active, generally! Press down through the feet and you can think about pressing your rear thigh back and rotating your front thigh outwards a little. While grounding down through the legs and feet, also think about the ‘lift’ and space you’re creating by lifting your ribcage away from your hips. Your shoulders will naturally want to try to hug your ears when you lift your arms, so draw them down away from the ears. You’ll feel your muscles working hard as this is very much a strengthening pose. Notice how your mind, facial muscles and breath respond to the hard work. Is your mind chattering about it being a challenge? Are you biting your tongue or lip?! Is your breath choppy? Try to connect back to a smooth breath, which will calm your mind and keep your facial muscles relaxed while you gaze ahead. Warrior II is good for improving balance and strengthening the muscles of the knee, thigh and ankle. It also strengthens the muscles in your shoulders and arms. You will definitely feel the muscles working after several breaths in the pose. Don’t try Warrior II if you have knee, hip or ankle injuries or have difficulty standing.